Tokyo Disneyland® Hotel, located next to the park, is a charming accommodation that offers various services for family groups. Experience the magical world of Disney by staying at this hotel with your family! If you are planning a family trip to Tokyo Disney Resort, how about staying at Tokyo Disneyland Hotel, which is located within walking distance from Tokyo Disneyland? Even though it is outside of the park, the world of Disney is alive in this hotel, and guests will feel as if they were still in the Kingdom of Dreams and Magic. There are many services that only guests can enjoy. 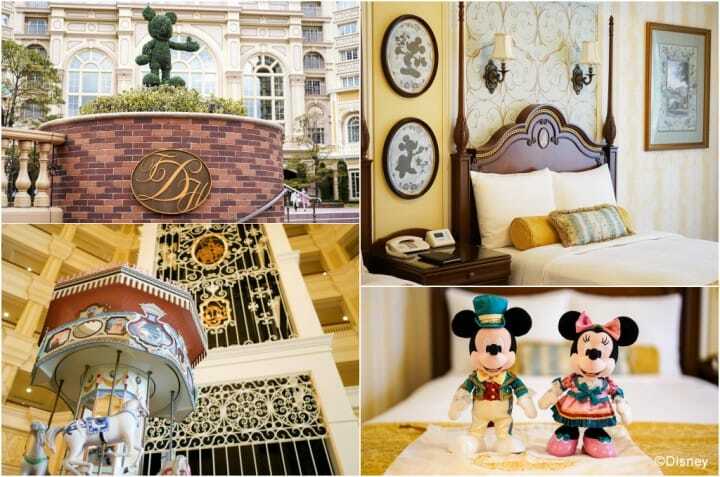 We introduce nice charming features of Tokyo Disneyland Hotel that make it a dream accommodation. One of the Tokyo Disneyland Hotel guest privileges is the Happy 15 Entry, which allows visitors to enter both Tokyo Disneyland and Tokyo DisneySea fifteen minutes before they open. It may not be much, but it makes a great difference. The park is not crowded yet, and the cast will be lined up to give high-fives to the visitors. A lucky few may even be able to meet the characters. With a fifteen minute head start, visitors can enjoy popular attractions, where usually a long line forms, with little wait. In fact, some attractions start at the time of the early entry. Moreover, you can make sure you get the convenient Disney FASTPASS®. Also, the shops will not be very crowded, so it may be wise to do some shopping beforehand. Popular or limited items might be easier to get in the morning hours. On the day MATCHA visited, our staff enjoyed attractions, obtained a FASTPASS, took photographs with the characters, and toured the photo spots. After a night at the hotel, do try the early entry! Most of the guests staying at Tokyo Disneyland Hotel are Disney enthusiasts. They will be thrilled to find cute designs of their favorite characters all around the hotel. The building is designed in Victorian style, which is the same as the World Bazaar in Tokyo Disneyland. The Mickey and Friends Square, located at the hotel entrance, is decorated with topiary of characters such as Mickey and Minnie Mouse, so don't miss them! The interior has an elegant atmosphere, filled with intricate designs. The cast plays a street organ in the lobby, lifting the spirits of the guests. The interior design of the hotel takes inspiration from the world of Disney movies. You'll be greeted by a Disney-themed dollhouse, a carousel with images from "Cinderella" and "Beauty and the Beast," and a mural with images from "Peter Pan". Also, take a close look at the ceiling lights and the carpet patterns, as Disney characters are discreetly embedded in the design. It might be fun to look for them with your children. Tokyo Disneyland Hotel offers services in several languages. The badges above the staff's nameplates show which language they can speak. If you have trouble communicating, look for a staff member in charge of your language. There are 706 guestrooms in total, divided into four categories. Family groups should reserve a Superior Alcove Room, as it is spacious enough to accommodate up to four people. The room is also designed in the Victorian style, with pictures of Disney characters on the walls. The balcony rails have Mickey-shaped openings on them. Mickey is also hiding in the bed sheets as well, so be sure to look for him with the children. There are two regular beds, a trundle bed which can be pulled out, and an alcove bed in the room. The alcove bed is originally set as a sofa which can be turned into a bed. If you need any assistance, just call the staff from your room. There are amenities for children, such as pajamas, slippers and cups. A bed rail can be provided for the children's beds so that parents can rest assured they will have a sound sleep. The room amenities are all exclusively designed for this hotel. Some of the items, such as the amenity case or the cups, can be taken home as souvenirs. The picture above shows the amenities at the time of our visit. Please be aware that they are subject to change. Guests can purchase a stuffed doll set of Mickey and Minnie Mouse. This special version is available only at this hotel. These items are also subject to change, so be sure to check at the time of your stay. The stuffed doll set can be found at Disney Mercantile, on the first floor of the hotel. The store also carries original items and products that are also sold in the shops within the park, so it is an ideal place to stop by for souvenirs. After a good night's rest in the world of Disney, it's time for breakfast. At Sherwood Garden Restaurant, which is located on the first floor, guests can enjoy a buffet style breakfast. There are about forty dishes, from warm meals to fresh fruit, to choose from. Not only is each dish delicious, but they are also incredibly cute and come decorated with Disney character motifs. For example, you can have a salad designed in the image of Tinker Bell or a Mickey Mouse-shaped waffle. The children's luncheon mats and baby bibs are also decorated with cute Disney characters. Some of the buffet counters are set lower than the others so that children can help themselves. Tokyo Disneyand Hotel guests can retreat to their rooms to take a break when their children get tired and sleepy while playing in the park. Thanks to the location of the hotel, getting back to the park after the break is easy. Be sure to have your hand stamped when you leave the park. This will enable a quick re-entry. Luggage is another thing that you might want to consider on a family trip. Tokyo Disneyland Hotel guests can use the free baggage claim and delivery service. After arriving at Maihama Station, go to the Tokyo Disney Resort Welcome Center located next to the station, hand over your luggage and the center will deliver it to the hotel. Or just leave the baggage at the hotel and then head straight for the park. During your stay at the Tokyo Disneyland Hotel, a Multi-Day Passport Special can be purchased at the Tokyo Disney Resort Welcome Center, or at the third-floor reception of the hotel. With this passport, guests can visit both parks from the first day. They will be able to enjoy the attractions and shows, along with shopping with special edition items. ** Children under three years of age can enter the park for free. The ticket information is current as of February 2019. If you're traveling with your family to Japan, how about spending an unforgettable time at the enchanting Tokyo Disneyland Hotel? The Disney magic will stay with you even after you leave the park. A stay at this hotel will undoubtedly become a long-lasting memory. Access 8 minute walk from the South Exit of Maihama Station. A short walk from Tokyo Disneyland Station (Disney Resort Line Monorail). Tokyo Disney Resort - By Train Or Bus? A Complete Guide On How To Get There! Enjoy a Charming Stay at the Tokyo Disney Celebration Hotel! Anna And Elsa's Frozen Fantasy At Tokyo Disneyland - Until March 2018! Disney Christmas 2018 - Celebrate The Holiday Season! 35th Happiest Celebration At Tokyo Disneyland! A Must-See Special Event! 35th Happiest Celebration! See The Water Show At Tokyo DisneySea!